This is an example of the understory algae (seaweed) the team is interested in. This complex habitat provides food and shelter to myriad fishes and invertebrates, including many that people rely on for fisheries. The rugged low power D-Opto range of dissolved oxygen instruments have made a tangible difference to the outcomes of a Santa Barbara Coastal Long Term Ecological Research (SBC-LTER) programme. The project’s objective is to determine the relative influence of land- and ocean-based forces on the forests of giant kelp (Macrocystis) off the Santa Barbara coast. These forces include river runoff, land use patterns, currents, upwelling, and waves. 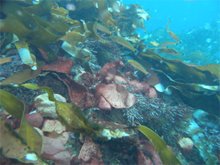 Research on seaweed, including primary production, has focused mostly on giant kelp. Primary production is basically a measure of plant growth, or how much sunlight-derived energy plants contribute to the food web. Thus it is an important measure of how ecosystems function. Recently the team begun to measure primary production of the smaller seaweeds that live close to the bottom, in the shadow of the kelp literally and figuratively. These ‘understory algae,’ as they are often called, can be highly productive, and also serve as a complex habitat for myriad small animals that are the main food supply for many fishes. The team is measuring algae production by measuring the oxygen the plants produce through photosynthesis over time in closed chambers on the bottom, in 5-10 meters depth. The D-Opto oxygen sensors have been ideal for this, since they can log data once per minute, are very accurate, and don’t need vigorous flow past the sensor to get a stable reading, as do electrode-based sensors. Most studies of this type only have beginning and endpoint measurements. The time-course data logged by the D-Opto allows the team to more accurately assess oxygen dynamics. The team does light incubations followed by dark incubations, in which they cover the chambers with light-proof cloth, to measure respiration. This also gives them a measure of gross production. So far, the results of this study have shown that lush foliose algae communities are more productive than low-lying turfs, as one might expect. However, turfs tend to be more productive for their size than larger seaweeds, as they are in other habitats like coral reefs. The team is preparing more detailed results from its first study for publication. Details to come! © 2012 D-opto ALL RIGHTS RESERVED.